So I won't be posting this ANYWHERE else! 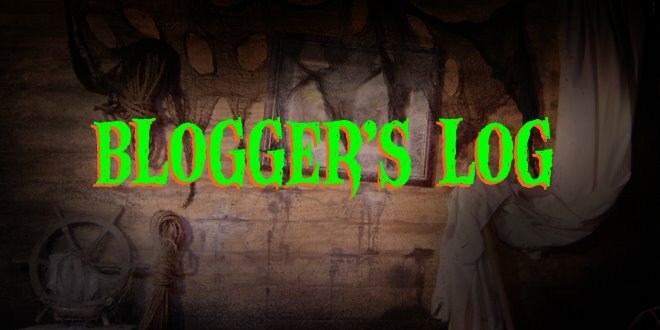 We appreciate your patience while we continue working on the second half of our riveting "Captain Keller" story line and again, I apologize at the wait you have all endured. That said, I want to share with you why it is taking so long to finish the darned thing. Here is a test for a matte painting I did last night (there are at least TWO more that I have to do). I don't have the necessary elements to complete the final shot, however I put this together to get an IDEA how it will all come together in the end. Instead of the Captain entering the mysterious Geckoniki temple, I used an existing green screen shot of the Goblin; so technically he has entered the building first. The final shot will have foreground elements (including bubbling lava pits!) and matched lighting on the Captain element. But you can see how effective this simple painting is going to be within the context of the story! So late last night (or early this morning) Phantom Harbor premiered its latest feature: Chando's Harbor-scopes! Chando, the genie that the Captain released for Sam Park's Birthday video has RETURNED! He's not here to grant any more disastrous wishes. No, he's here to read YOU your monthly Astrological forecast! 2) Click on "Captain's Quarters"
3) Click on "Messages" and you'll see a button for Chando's Harbor-scopes! 4) Enjoy and prepare yourself for what August has in store for YOU! So, things are heating up again here at the Harbor. 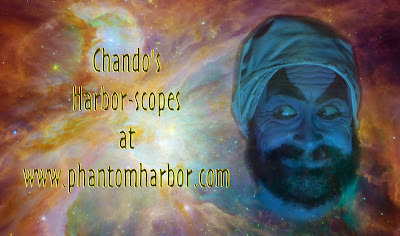 This week should bring you what we are calling "Harbor-scopes" brought to you by our genie-buddy, Chando! Yes, he was irritating granting our Captain's wishes, but in divining your future, he is as accurate as any other astrologer out there! Here's how it works: Every month, Chando will gaze at the stars and then record a video report for that month. August's forecast will be available later this week. I know, I know, you're excited as heck! How can you find this precious information? But, Shannon, I've looked and I don't know where to find the "Message" section. The Message center is in the Captain's Quarters for the time being. Soon, it will more obvious as we continue to overhaul the site. You'll notice that also, in the Message section there are icons for "Announcements", "Birthday Greetings" and the new "McAllister Interview" section, where in the coming weeks, The Captain hopes to interview guests that should be interesting to our audience so stand by! It's all happening at Phantom Harbor, so don't be shy. Visit the site, recommend it to your friends and we will continue to produce more fun and adventure for you all! So what a busy few weeks we've had here at the Harbor! First of all, let's talk about the two great new videos that are now on the Vimeo Channel. One is a new Phantom Harbor Promotional Video set to the tune of the theme from MANNIX! Something about the great sounds of Lalo Schiffrin really blended with the lunacy of Phantom Harbor. It's a great combination. Second is parody of the trailer for a recent French film entitled "Mademoiselle Chambon." Tracy Shea, our live action director and my wife, and yours truly saw the trailer this weekend whilst trying to find SOMETHING to watch in the movie theaters. The trailer was so pretentious that we HAD to lampoon it and did we ever. The resident Goblin was all too happy to assist us with our efforts. Today, work began on the Geckoniki hand puppet. Working strictly from scratch, I had to build the armature from the ground up (proudly with pieces I had just lying around here). I managed to get SOME clay on it after a couple of hours. It's rough, but you can see the direction it's heading (no pun intended). Take a look at the videos, photos, etc. and do NOT forget that starting next week, you'll be able to get your "Harbor-scope" from the great Chando! More on that soon!